An Egyptian numerology instructor has released her debut educational guide that aims to help others use numerology techniques to discover areas in their lives that contain untapped potential and elevate their frequency rating so that they can maximize their unique gifts and assist in utilizing these gifts to evolve in equanimity and fulfill their soul contracts. In “Egyptian Numerology: Emergence into the Fifth Dimension,” author Sara Bachmeier, who has been charting Egyptian numerology since 2016, presents readers with an easy-to-use guide to living fully through the heart chakra and, ultimately, provides them with a clear direction in which to find and follow their divine soul lifepath, soul life purpose and destiny. 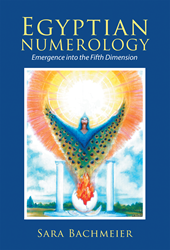 Focused on equipping both spiritual students and teachers with key insights into soul nourishment, “Egyptian Numerology” offers readers a helpful tool on how to use numerology to expand, enhance and grow while evolving through the doors of the fourth dimension. Sara Bachmeier is a certified instructor in Egyptian numerology, Complete Cellular Mind Body Alignment and Activation (CCMBA), Complete Cellular Soul Memory Clearing (CCSMC) and META, a women’s self-defense and empowerment program. Bachmeier has been charting Egyptian numerology since 2016 and has studied numerology all her life. She holds an associate of science degree, previously taught nursery school for 25 years and opened her own preschool in 1993. Bachmeier currently resides in Sedona, Ariz. To learn more, please visit http://www.sarabachmeieregyptiannumerology.com or http://www.egyptiannumerology.org.